Here are the accounts for Kirby cane Charity for the year 2015-16. (Click on the link below and backspace to return to text.) The rents remain set at the same level as last year as does the commentary on the accounts. Basically, the trustees can act with impunity in all that they do as the Charity Commission is quite useless at policing small charities. 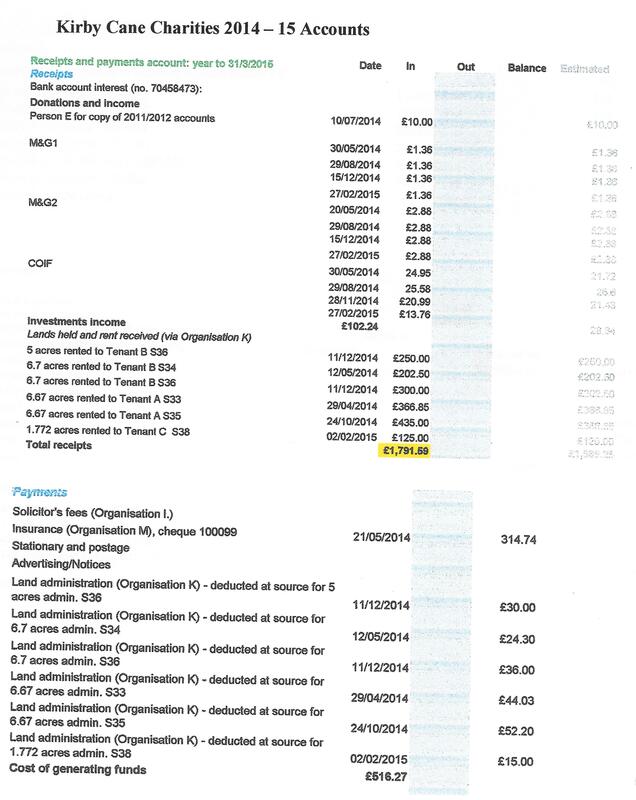 The rents collected by the KCC charity trustees for Parish Land have remained unchanged since, at least, 2010/11. The first change in all these years only came in October 2014. It breaks down as follows: Poor’s Allotment (5 acres) remained at £50 an acre, despite the subsidy of £85 an acre being claimed by the farmer and Savills – Smithsgore reporting arable land average rents at £129 an acre. Mud Hall (6.7 acres) with the increased rent as at October 2014 gives a rent of £75 an acre. Lease Land (6.67 acres) with the increased rent as at October 2014 is £120 an acre; highlighted because this is the only land rent that would seem to meet the national figures and gives an indication of what rents can be achieved for Parish Land. Parish Allotments (1.8 acres) is rented at £69 an acre with no subsidy being claimed on this land. As to outgoings; it is here that an element of discretion is to be expected of the trustees as grants are made to individuals deemed needy within the restrictions of the charity governing documents. However, donations to clubs and societies need not fall within this requirement and it is a sad reflection on the KCC trustees that they continue to maintain secrecy where it is neither required, nor wanted. It can only help transparency and trust if the trustees show faith in the villagers in order to gain trust of the vilagers. Personally, I would like to see open meetings of the trustees with only the issue of private donations going to closed sessions. 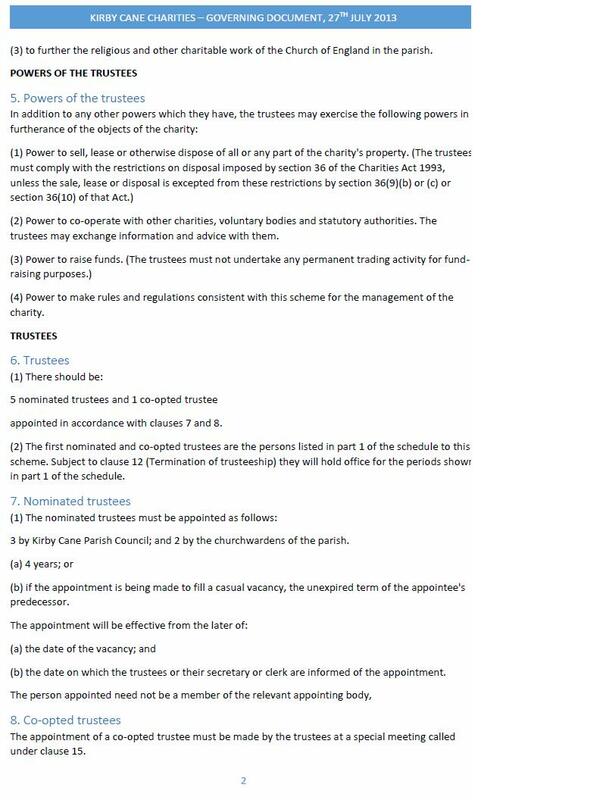 Another aspect of the KCC accounts is what seems to be a failure to meet the requirements placed upon the trustees by the Objects of the Charity mentioned in the trust document. It seems that the trustees are only able to help on a personal basis which would rule out donations to clubs and societies. Here is an area that could well be discussed by the villagers to see what they would like the trustees to do about these requirements. KCC Investments: These are held in M&G and Coif we are told but no detail is given as to the value of these holdings. The return on the year was £102. The preamble to the Ellingham United Charities story concerning the historic background to the period in question applies equally here. The Kirby Cane Charities story starts a little earlier and takes on a different direction to that of Ellingham United Charities. However, whilst the history of the charities through the twentieth century can be seen to be relatively supportive of the aims of providing for the poor, the history prior to that seems to be somewhat questionable. 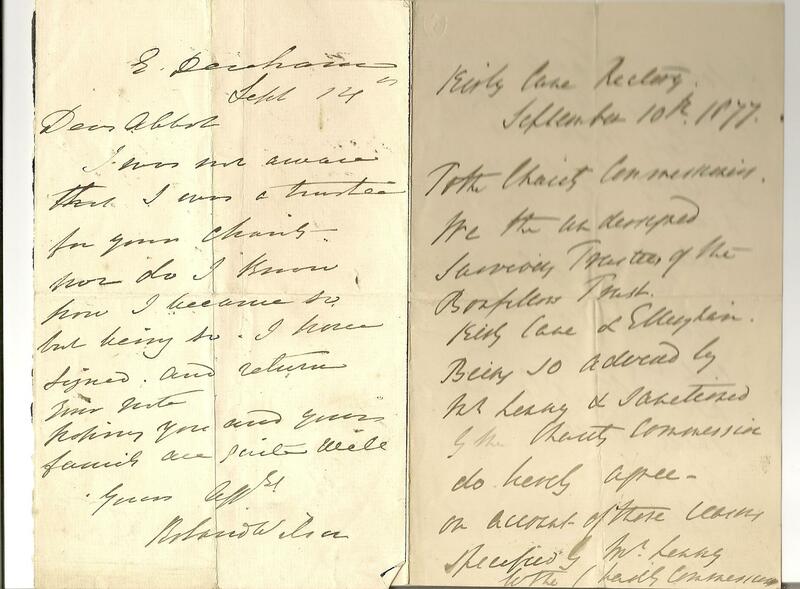 As an aside here relating to Roland Wilson; the records include a letter to Reverend Abbot Upcher from Roland stating; ”Dear Abbot, I was not aware that I was a trustee for your charity nor do I know how I became so but being so I have signed and returned your note.” The “note” was in fact a letter to the Charity Commissioners to sell some charity land to pay off copy-hold fines. (Appendices 11 and 12) So here we have it again, the charity lands are being raided to pay off debts, which were essentially monies claimed by the Lord of the Manor to give a right of freehold, and also we see strange goings on relating to who appoints the trustees. We might say ‘ever-twas-thus’ as even in modern times there has been a failure to comply with the correct procedure for appointing trustees. By 1896 the struggle for the control of the Kirby Cane charities was won and the new Charity Commissioners Scheme of 1897 removed the payments to the church altogether, other than the small amount allowed for by the original benefactors towards the work of the church. The role of the Rector in the management of the Kirby Cane Charities was also removed entirely and left in the hands of the churchwardens and the Parish Council. So on April 10th 1897 there is the first meeting of the newly appointed trustees at the house of Edward Clare; who becomes chairman of the trustees. They resolve there to; “…purchase a deed chest to preserve the documents of the Charity Trusts to be kept at the Parish Council room.” (Appendix 9) Over the next few months these new trustees set about collecting the rents due; setting up arrangements with the bank for receiving dividends; deciding upon how to distribute the funds in the way of fuel; attending meetings in Loddon to protest against land tax, and winning; arranging a public meeting with an expert speaker to explain fully the charities for the parishioners; a Clothing and Boot Club was established; coal was purchased for distribution and an Evening Continuation School established. By December 22nd 1897, a matter of eight months, all this had been achieved under the new leadership. So then the charities trustees continued to operate in this business-like manner for the next decade during which time they allowed the Rector to become a trustee. 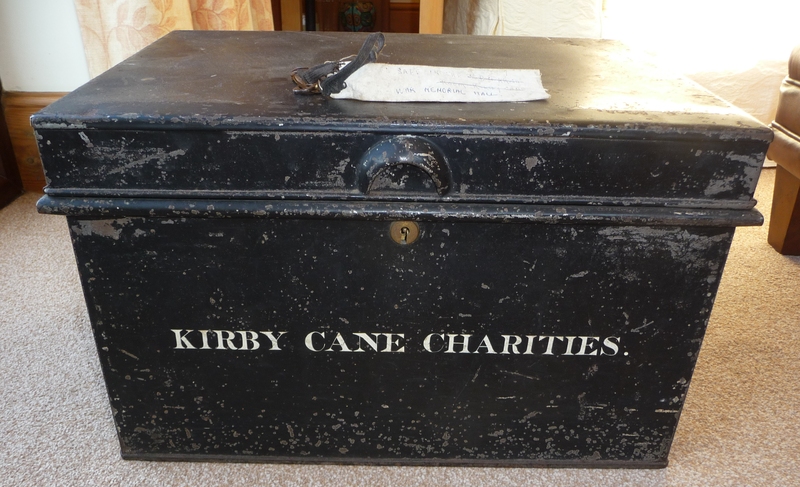 After further revisions the Kirby Cane Charities are now managed by a Scheme introduced in 1999. (Full details in Appendix 14) This scheme continues to allow the Parish Council to appoint a majority of the trustee’s positions and demands that income from the charities assets should be shared 95.3% to the charitable objects and 4.7% towards the church. There is controversy surrounding a bequest made by Lititia Dawson in 1745; “…a cook in service (?) 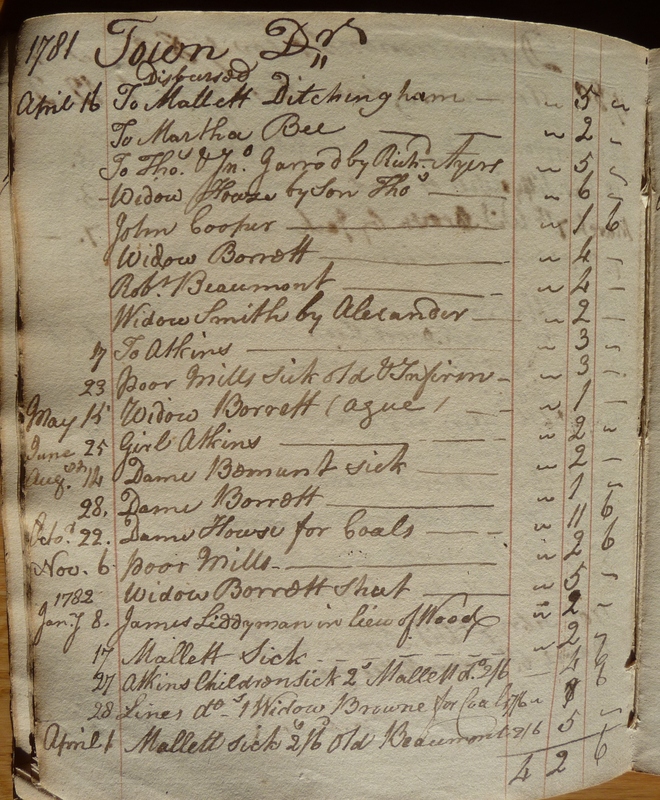 Turner’s Family…” It seems that £2 each year was to be; “…laid out for bread for the poor…” A scrawled entry (Appendix 2) under the details of this bequest, made in the later 1700’s it would seem, states; “This mony (sic) expended for the making new seats in the church.” A later entry, 1768 tells us a bit more about the money being used for paving in the church. Who wrote this we will never know and we can only guess at what the real story behind these notes was. In 1759, and onwards, somebody called Widow Fryar crops up in the record relatively regularly; “…fetching flags 2/-…Goody Fryar for shoes 2/-…Widow Fryar having been ill 2/-” and other amounts regularly sent by “her girl”. In 1772 there is the following entry; “Breaking ground and burying Widow Fryar 5/-“. She had been sick for a good number of years and we are left to wonder how she and her family had coped throughout all these years. 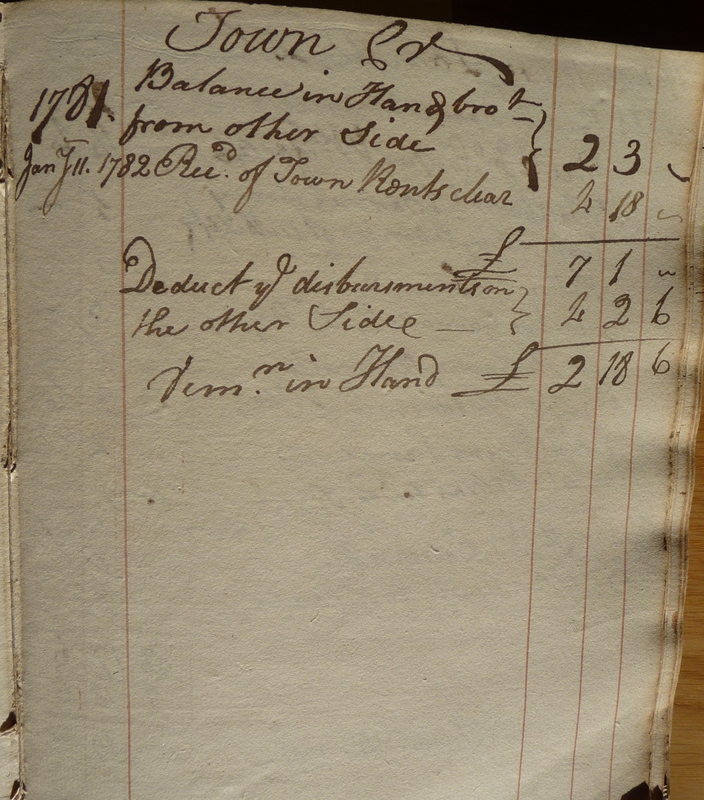 In the summer of 1794 charity proceeds were given to poor of Kirby Cane in; “money and hemp cloth”. Looking at national statistics from a Google search for the weather in the 1700’s we find that the winter of 1794-95 was the coldest since records began in 1659. Frost fairs were held again on the frozen Thames. 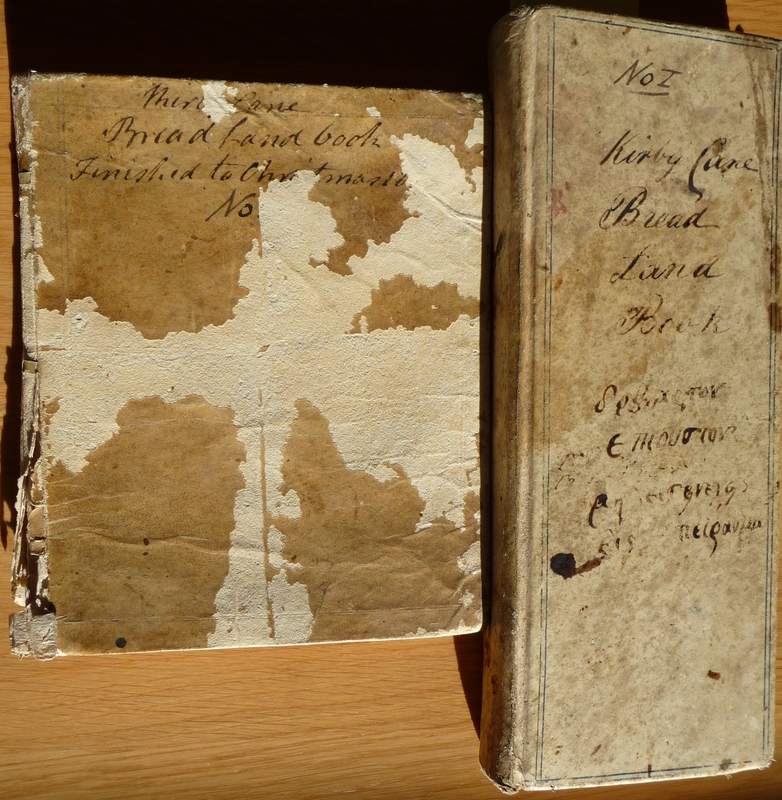 This might give a clue to the reasons for the next little story the records show from the winter of 1794-95: “Received of James Richmond one guinea for the poor of the Parish; it being a fine set upon him for stealing wood out of the Hall yard. 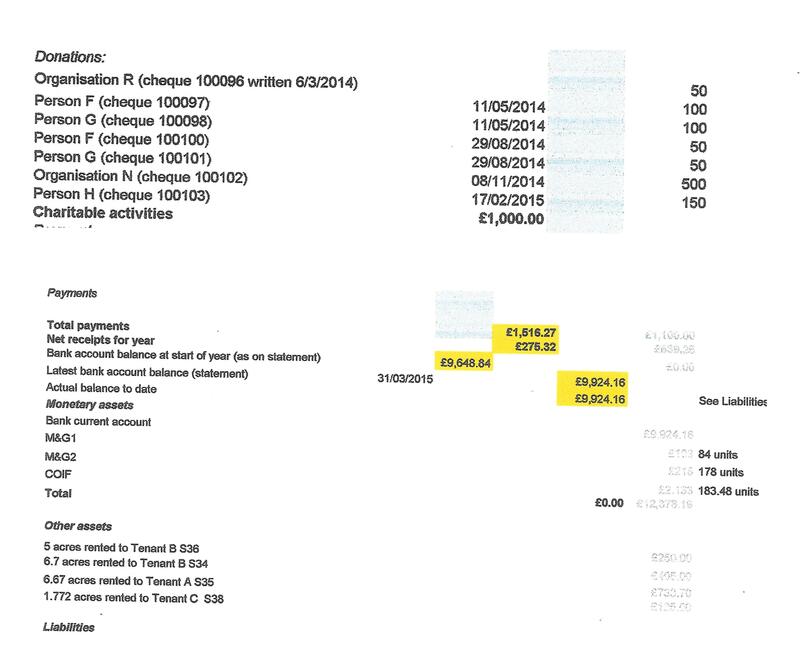 10/6 of which was given to the informer & 2/- for a search warrant. Remains for poor 8/6.” So we are left to wonder was James Richmond badly in need of wood, or was he out to make a profit by stealing and selling on? Perhaps, in that he paid the fine, he was not so poor as to need the wood for himself. What is sure from this entry in the records is that justice was swift and local. December 23rd 1776 the burial of one called Daines was “…charged on the parish…” , the coffin, grave digging and certificate cost twelve shillings; the coffin bearers for “…carrying to church…” four shillings; a Mrs Laws was paid four shillings and fourpence hapenny for something which is indecipherable, but perhaps mourning; the Rector took one shilling for “…burying him…” and finally there was a charge of two shillings for “…Jay going to Lodon(sic) for certificate…”; in today’s money the grand sum of £1.25. Returning to the national picture again for a moment, it was seen in the preamble to the Ellingham United Charities story that: “All the inhabitants of Geldeston, Ellingham and Stockton had the liberty of Common in Micklefen which stretched from Pewter Hill to Dunburgh. But, as the historian E Thornhill noted: ‘Alas, it has long since been taken from them.’” (Suffolk and Norfolk Magazine, April. 2011). Looking at the lie of the land, it is obvious that the commoners of Kirby Cane might be included in with those who had been dispossessed of their common land by the local dignitaries. Here comes the rub however; in 1806 the charity accounts are raided to pay; “Messrs Taylor and Browne the Commissioners charges for Inclosure. £14..11s..0d.” So not only did the poor lose their land, but were also made to pay for the privilege. 1808 sees the first deliveries of coal to the poor by a Mr Dowson, but wood deliveries also continue for some time. 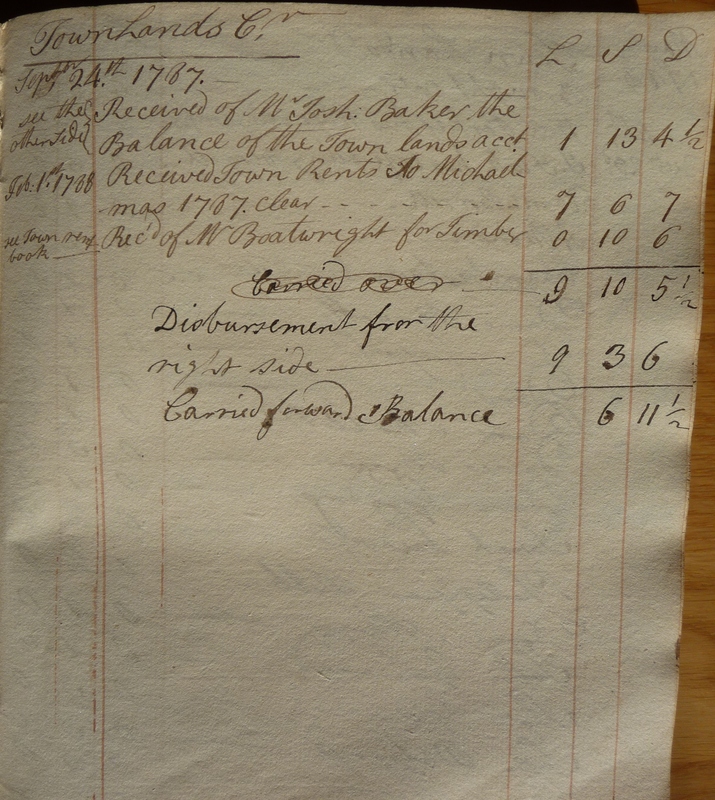 Evidence for use of barges to bring in the coal to Ellingham up river is seen in 1818; “To Mr Kerrison Lockage £1..0..0 … To Mr Man for warfage 5/-“ These payments can be seen for a while after this first entry in the records. 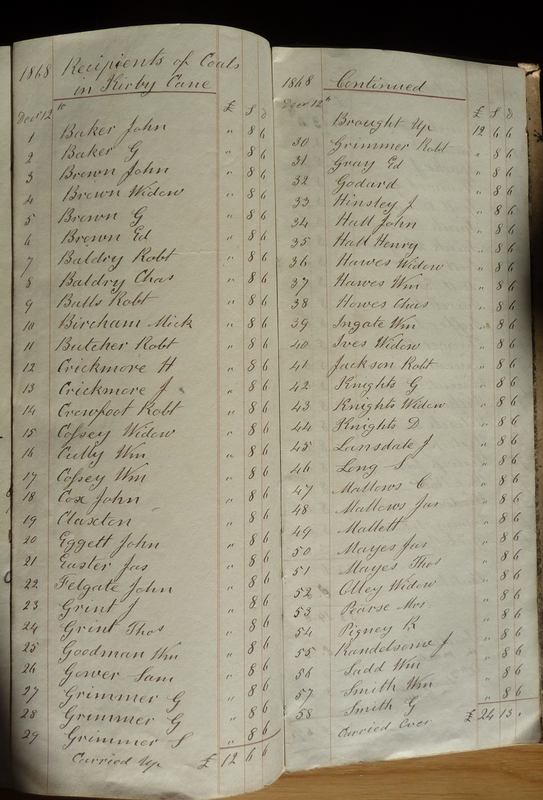 In 1821 there is the first examination of the Breadland accounts of the Kirby Cane Charities since this record book began in 1759. 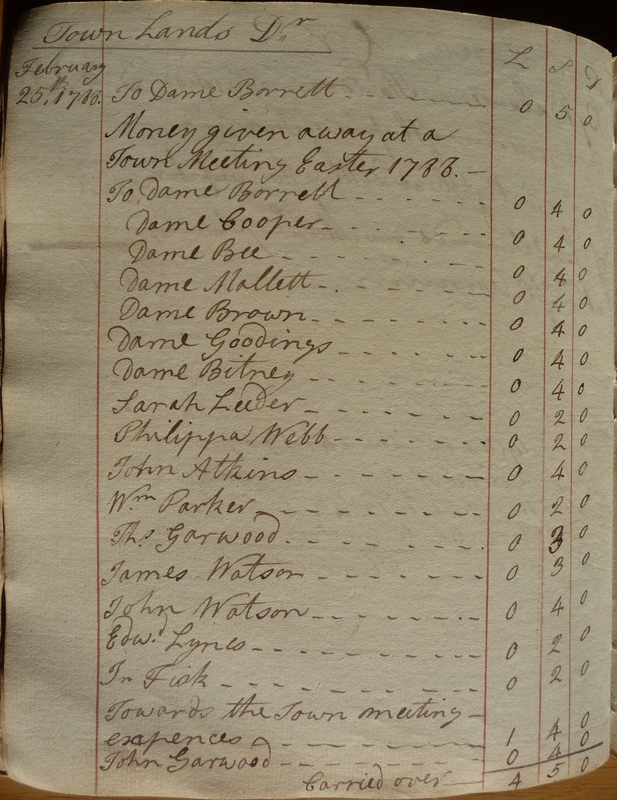 The accounts were examined at a Town Meeting on April 9th 1822 and signed by the Rector Henry Wilson, Thomas Williams and another whose signature is illegible. There are mentions of Town Meetings at other times when the rents for the charity lands were collected and some money given to the poor. The other charity accounts seem to be regularly signed by the Rector and the Overseers for the Poor. We get an idea of the way in which society was divided by class in the charity minutes of September 1891 when the trustees considered the wishes of three of the “Labouring Parishioners” to have some of the Pott’s CharityLand for allotments. 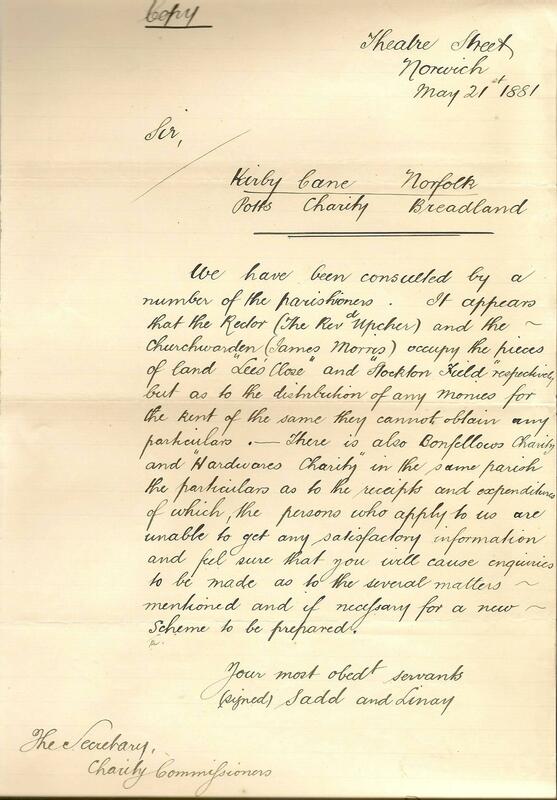 In the early 1900’s the Kirby Cane trustees are quite happy to take on the Charity Commissioners again to protect the rights of the parishioners to the proceeds of the charities. There had been demands from the Charity Commissioners that part of the Kirby Cane charity proceeds be given to the Education Department as a result of the 1902 Education Act. The dispute rumbles on and in 1909 the trustees write to the Charity Commissioners: “…as they (the trustees) are quite willing to expend annually such a sum (£10) whenever the circumstances of the parish seem in their judgement to demand it…” This proposal, basically telling the Education Department to take their hands off Kirby Cane charity proceeds was carried unanimously. Whilst an Educational Endowment was set up by the trustees at that time, it is still encouraging today, in the twenty-first century, to see such steadfast defence of local rights by our forebears. In 1908 the trustees can be seen to taking their guardianship of the charity lands seriously when they remind the tenant, Mr Tiles, not to grow corn on the field two years in succession. 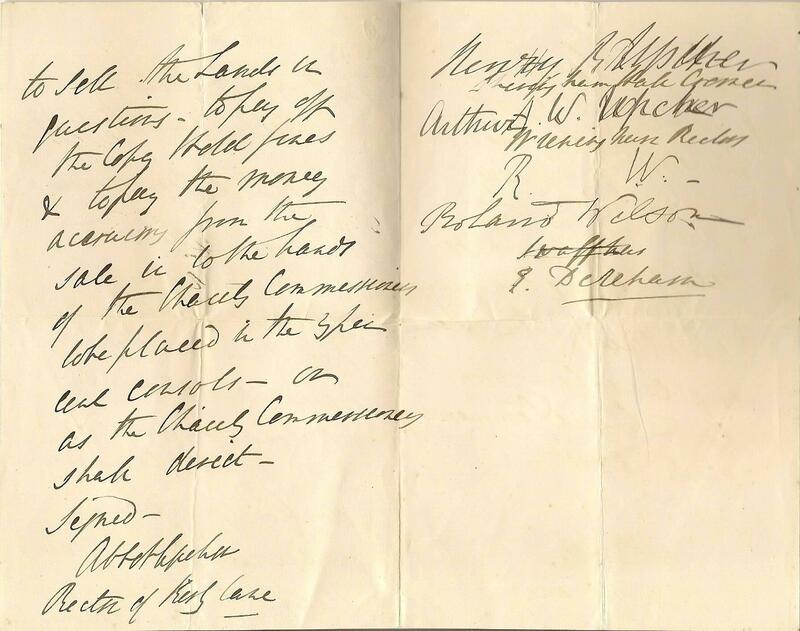 Three people were questioned closely about their earnings by the trustees in December of 1911 whilst making decisions about whether or not they would be entitled to coal tickets. They were asked to leave the room whilst the trustees conferred and; “…after considerable discussion it was finally and unanimously decided that their applications be refused.” This seems to be quite a draconian way of handling matters and we can imagine that there might be some bad feeling after such a decision. At the meeting of the trustees in May 1955 Mr Osborne, clerk to the trustees, tendered his resignation. He had given 58 years service to the Kirby Cane Charities. They failed to see that trustees were appointed correctly. They have failed to distribute funds according to the trust document. There are also outstanding questions to be answered concerning renting of lands, rents paid and EU subsidies claimed. 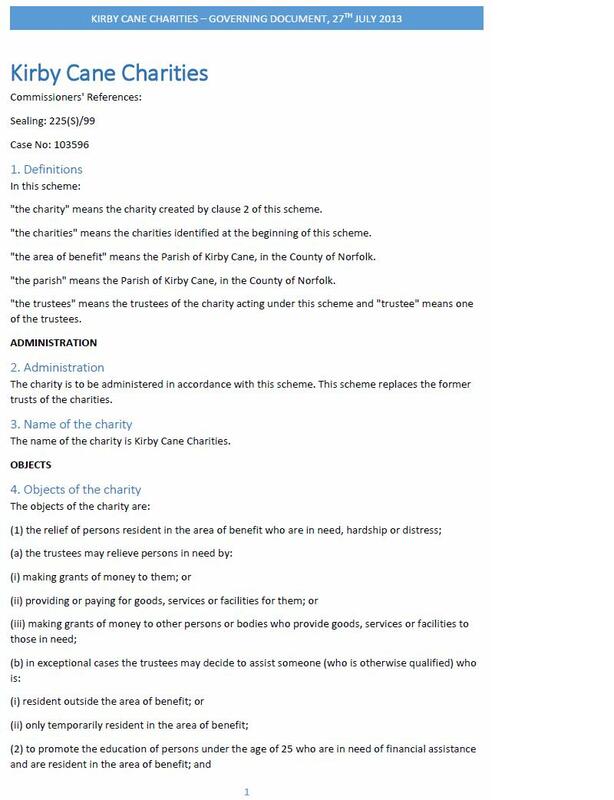 Here is a copy of the new scheme for the Kirby Cane Charities, introduced in secret by the present trustees without any consultation at all with the Parish Council, or the villagers via a public meeting. Basically, what it does is to remove the restrictions placed upon the trustees as to how they spend the money. So the restriction of spending just 4.7% of income for religious purposes is now removed. The previous scheme follows this present scheme for comparison and it also includes the schedule relating to the land managed by the charities. This scheme has been adjudged as not liable to stamp duty. 2. Administration The charity is to be administered in accordance with this scheme. This scheme replaces the former trusts of the charities. 3. Name of the charity The name of the charity is Kirby Cane Charities. (2) to promote the education of persons under the age of 25 who are in need of financial assistance and are resident in the area of benefit; and (3) to further the religious and other charitable work of the Church of England in the parish. 6. 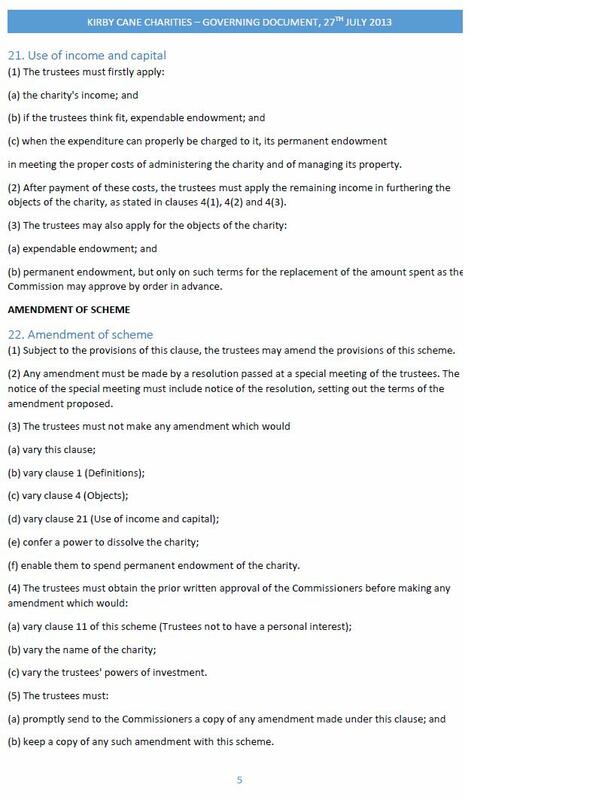 Trustees (1) There should be: 5 nominated trustees and 1 co-opted trustee appointed in accordance with clauses 7 and 8. (2) The first nominated and co-opted trustees are the persons listed in part 1 of the schedule to this scheme. Subject to clause 12 (Termination of trusteeship) they will hold office for the periods shown in part 1 of the schedule. 7. Nominated trustees (1) The nominated trustees must be appointed as follows: 3 by Kirby Cane Parish Council; and 2 by the churchwardens of the parish. (1) a copy of this scheme and any amendments made to it; (2) a copy of the charity’s latest report and statement of accounts. 10. Register of trustees (1) The trustees must keep a register of the name and address of every trustee and the dates on which their terms of office begin and end. Every trustee must sign the register before acting as a trustee, whether on their first appointment or on any later re-appointment. 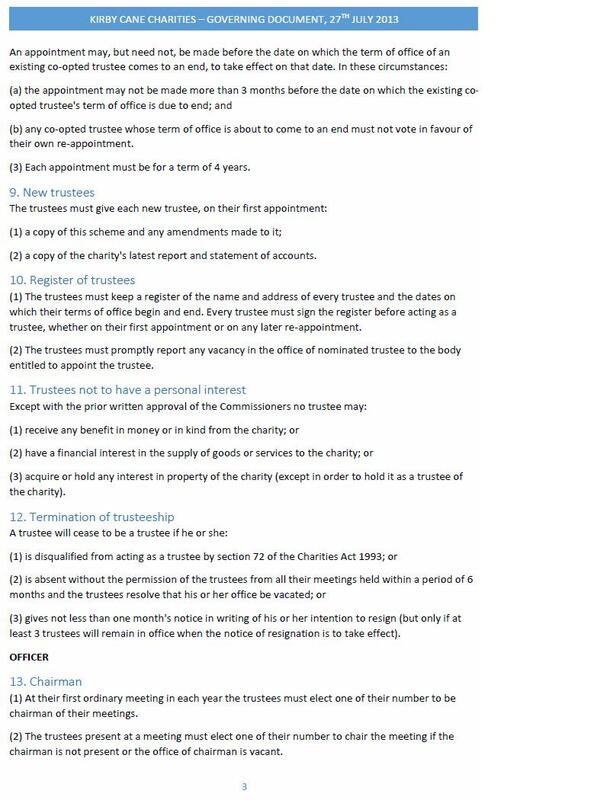 (1) is disqualified from acting as a trustee by section 72 of the Charities Act 1993; or (2) is absent without the permission of the trustees from all their meetings held within a period of 6 months and the trustees resolve that his or her office be vacated; or (3) gives not less than one month’s notice in writing of his or her intention to resign (but only if at least 3 trustees will remain in office when the notice of resignation is to take effect). 14. Ordinary meetings (1) The first meeting after the date of this scheme must be called by Iain Duncan Wright or, if they do not do so within 3 months from that date, by any 2 trustees. (2) The trustees must hold at least 4 ordinary meetings in each 12 month period. (3) Ordinary meetings require at least 10 days’ notice. (4) The chairman, or any 2 trustees, may call an ordinary meeting at any time. 15. 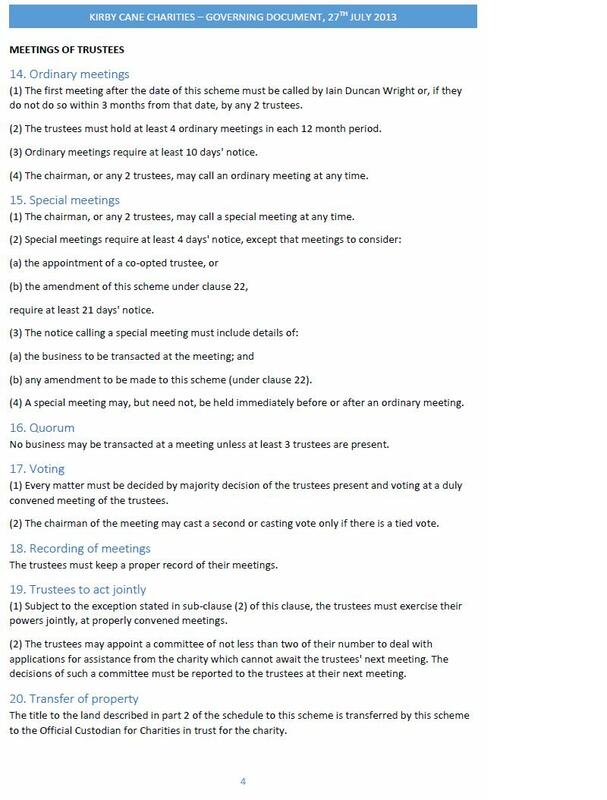 Special meetings (1) The chairman, or any 2 trustees, may call a special meeting at any time. (2) Special meetings require at least 4 days’ notice, except that meetings to consider: (a) the appointment of a co-opted trustee, or (b) the amendment of this scheme under clause 22, require at least 21 days’ notice. (3) The notice calling a special meeting must include details of: (a) the business to be transacted at the meeting; and (b) any amendment to be made to this scheme (under clause 22). (4) A special meeting may, but need not, be held immediately before or after an ordinary meeting. 16. Quorum No business may be transacted at a meeting unless at least 3 trustees are present. 17. Voting (1) Every matter must be decided by majority decision of the trustees present and voting at a duly convened meeting of the trustees. (2) The chairman of the meeting may cast a second or casting vote only if there is a tied vote. 18. Recording of meetings The trustees must keep a proper record of their meetings. 19. Trustees to act jointly (1) Subject to the exception stated in sub-clause (2) of this clause, the trustees must exercise their powers jointly, at properly convened meetings. (2) The trustees may appoint a committee of not less than two of their number to deal with applications for assistance from the charity which cannot await the trustees’ next meeting. The decisions of such a committee must be reported to the trustees at their next meeting. Freehold land containing 8.8 hectares or thereabouts (formerly described as 21.75 acres) situate at Kirby Cane in the County of Norfolk, being the land numbered 3572, 5150, 0046 and part 2936 on the Ordnance Survey map (1970 edition).